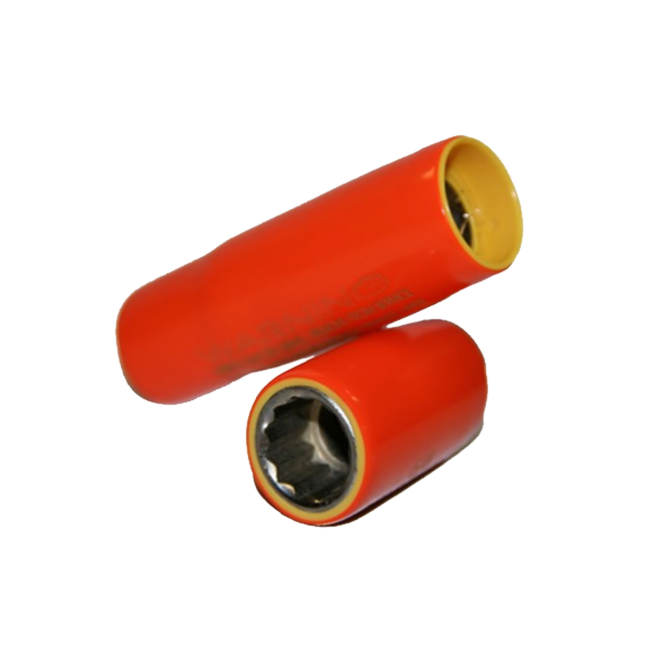 Cementex offers 1000V insulated sockets for use with insulated tools including ratchets, torque wrenches, extension bars, t-handled square drivers, breaker bars, etc. Cementex offers both standard and deep wall length sockets in 1/4″, 3/8″ and 1/2″ square drives in every available SAE and Metric size. Each style of socket can be done with or without a boot. Booted sockets are the standard, sockets without boots are available upon request. Boots create an additional protective barrier over the drive tang to ensure there’s no exposed metal when the socket is assembled with items such as an extension bar. Cementex standardizes on 12 point sockets in the 3/8″ and 1/2″ square drive, however, 6 point sockets are available upon request. 1/4″ square drive sockets are only available as 6 point. Sockets are available individually as well as included in stock kits typically with ratchets and extension bars. Cementex will customize any existing kit or work to develop a kit containing specific sockets that you need.